Welcome to the 2018-19 school year! I hope it was a restful and fun-filled summer. I look forward to seeing all of our returning students and getting to know our new families. It is very nice to hear about all the wonderful adventures our students experienced over the summer. I want to give a big ‘THANK YOU’ to our staff for all their hard work to start off this year in a smooth, efficient way. Teachers have worked hard getting their rooms organized and ready for our students to learn. Office and custodial staff have also worked extra hard to get the school clean and ready for a great school year. We have many exciting events planned for our students and their families this school year and I invite you to take an active part in those events. Finally, I want to say ‘THANK YOU’ to all our families for the support you give us. You make such a difference in our ability to succeed at the Early Learning Center. 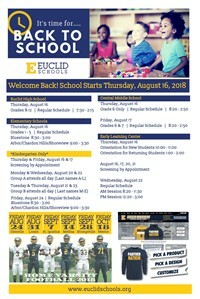 Be sure to check out our "Back to School" information in the next Euclid Observer for all the latest dates, news, and updates to get ready for the 2018-2019 school year! Click here to download. 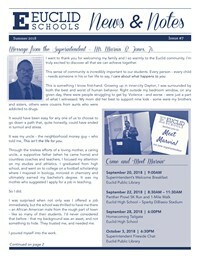 The latest issue of the Euclid City School District "News & Notes" features an introduction to new superintendent Marvin B. Jones, II, important back to school dates, a message from the Board of Education about a renewal of our critical emergency levy this November, and everything you need to cheer on the Euclid Panthers this fall! You can download the newsletter at this link. Read our latest newsletter to learn about the great things happening at the ELC. We believe quality early childhood education should be affordable for all children. If your household income is below 100% on the attached scale, there are many funding sources that can get your parent contribution down to $0. All students must have both a physical and emergency form completed and on file. If your child requires medication to be administered during their time at school, please fill out this form and return to the school health aid. Like the Early Learning Center on Facebook to see what we are up to!